The title thing is making me crazy, especially when I choose not to post daily when I am home. Maybe I will revert to “Thursday September 22” or something equally as creative. For now, however, I just wanted to hit the highlights. It has been a delight being at home this time of year. I think September and October in the Klamath Basin are the most beautiful months. The days are warm and still long enough to accomplish something. The nights come earlier, but they are cool enough for early bedtimes with good books and the soft summer down comfortor. Mo has been filling her days with outside tasks around the property, while I have been catching up on work, mostly at home, but going into the office every now and then. Sometimes it’s great to go to town for work, since otherwise I would just think the drive too long and the gas expense not worth it. When I go to town, I get to have great conversations with Chris, my local boss, about all the interesting mapping he is doing, all the soily gossip about what is going on in what survey office, and just general good stuff. I also have a chance to shop, get fresh groceries and do the (wandering around kind of) shopping that doesn’t interest Mo in the least. Joanne’s Fabrics is always fun, and I walk around feeling everything and daydreaming about the great things I could make if I had a sewing machine. My sister is a quilter, my daughter makes amazing costumes for theater and her pirate gatherings, and for years I used to love to sew. My life changed, and I haven’t had a sewing machine in 20 years. Often I say, “well, if I had a sewing machine I could do X, or Y, or whatever”. Enter my 66th birthday, and with some various contributions from various folks, including myself…ahahaha….I have a sewing machine! My sister suggested I try to find a used Bernina 1230, her go-to machine even though she has a much newer one. After some searching on E-Bay and on the local Craigs List, I actually managed to win the bid on a machine. After paying for it with a credit card, with my CURRENT ADDRESS on the card, I received a lovely email from the gentleman saying he had just mailed it with full insurance to my CALIFORNIA ADDRESS!?!?! OHNO! I guess that address was still buried somewhere in EBay even though I haven’t lived there for almost two years! With some panicky phone calls and some retracted insured mail, eventually I will get my sewing machine. Hopefully I will remember what X and Y were. We actually have a tiny quilt shop right here in Rocky Point and I have never checked it out. I guess it is time I did. Beautiful warm days call for tomatoes, and finally I can say that the greenhouse is providing. The heirloom Brandywines I tried to grow are still green, but Yellow Boy is producing bundles of incredibly sweet yellow good sized tomatoes, and the Willamette variety is doing well for big reds and Sweet 100 has provided bowls of cherry tomatoes. With the fresh lettuces, spinach, chard, peas, onions, basil, baby carrots, 3 cucumbers, and a very few green beans, I declare the greenhouse a success. I actually had enough ripe tomatoes to dig out one of Mo’s old family recipes for Tomato Chili Sauce. It was fun to make, a bit like a relish or chutney, with tomatoes, green hatch chilis, onions, with cider vinegar and some sugar, and then some very interesting combinations of spices including cinnamon, allspice, lots of chili pepper, and other sorts of things that I wouldn’t normally use in this kind of recipe. The resulting sauce/relish is delish on meat as a condiment, and if I ever stop dieting, I plan to try it on a hot dog! The other major project going on around here is house painting. Mo found an outfit in Klamath that seems to be a bit more thorough than the last folks who stained the big cedar house. Even so, they seem to come and go at odd times, they are getting the old sealer stripped off in preparation for the new stuff. Living in the forest as we do seems to cause a lot of mold to grow on the cedar siding in spite of regular care. They have been power washing for a few days now and hopefully will get it sealed again before the rain starts. I love this time of year, especially the Halloween season, and fall in general. My orange totes full of goodies are calling to me, and I keep finding little halloween-y things to add to my stash. One of the reasons for a stix and brix, I can decorate to my hearts content and somewhat to Mo’s consternation. I am using all my will power to NOT put out a single fall decoration until October 1st. Just a few days. We celebrated the gorgeous late September days with another kayak out on Pelican Bay. The water is getting low this time of year, and the water plants and algae are thick. Even so, the water is still incredibly clear in Recreation Creek and out into the Bay. Only when you reach Klamath Lake proper do the weeds and algae get so thick that paddling is no longer fun. We have paddled some incredibly gorgeous lakes, with crystal clear water, and not a water plant in sight. They are beautiful, but then there a no birds, often we are lucky to see a lonely duck in those lakes. Our Klamath Lake is fecund with life, and has been so since the 1850’s when John C Fremont declared the lake unfit for even horses to drink. It’s not all about pollution, it is about the natural life span of a lake formed many thousands of years ago, and filled with phosphorus rich volcanic ash from the Crater Lake (Mt Mazama) eruption 7,700 years ago or so. That beautiful, rich, smelly, plant life, brings in millions of birds in the spring and the fall, with many spending their summers here getting fat on all that food. When in Alaska, one of the exciting things for folks are the eagles, with eagle traffic jams and many photographers excited about seeing eagles in the wild. I did take photos of eagles there, but was a bit less excited than some folks because we have eagles here in the basin. There are nesting pairs along the lake, and several hundred birds feast on ducks and fish in the wildlife refuges. I actually get more excited about my favorite white pelicans than I do the eagles, but yesterday on the lake I was treated to both. We spent a couple of hours on the water and invited a Rocky Point friend to go along since we now have extra kayaks. It was a perfect way to spend a late September afternoon. This weekend I will be running off to Colorado for my grandson’s wedding. First a drive to Portland to spend the night with my oldest daughter, then the two of us will board a flight to Denver, Colorado tomorrow. There we have rented a car to drive to Sterling, where Deb will hostess (and pay for!) the Rehearsal Dinner for her son and his bride-to-be and about 20 other folks. Saturday is the wedding with most of Jessi’s family, and only some of us from Matthew’s side who can manage to get away to Colorado. It should be a lot of fun, as well as a bit interesting, with all those side stories that go on in families providing some extra entertainment. There are photos of the gardens here and photos of the kayak on the lake and the birds here. The morning dawned brilliantly, with most of the summer fog lifting even before we were out of bed. We called the storage facility at 8:30 and “Mr. Wilson”, a charming and very accommodating gentleman, said, “If you are a Harris Beach I’ll meet you at the storage facility right now.” Seems as though he made the right purchases at the right time, with several storage facilities and home rentals scattered throughout town. He drove up in his new Prius, and measured all the door openings to find one that was 12 feet high. We found a great space, with plenty of room to back in, and he was fine with us paying him now and having the rent begin on November 1st. With that major chore accomplished, we wandered around town a bit and did some shopping before ambling back home to our lovely sunny spot with a view of the ocean in the distance. Lunch was simple and we relaxed and waited for Connie and Tracy to appear in mid-afternoon. Right on schedule, at 2PM, the two of them walked into our campsite with Hunter, the beautiful greyhound dog with fine manners and an incredibly sweet disposition. Hunter and Abby got along well, and Jeremy who was outside on the step, thought that this large new creature was incredibly interesting. As is often the case with RVing friends, we launched right into comfortable conversation at the picnic table. 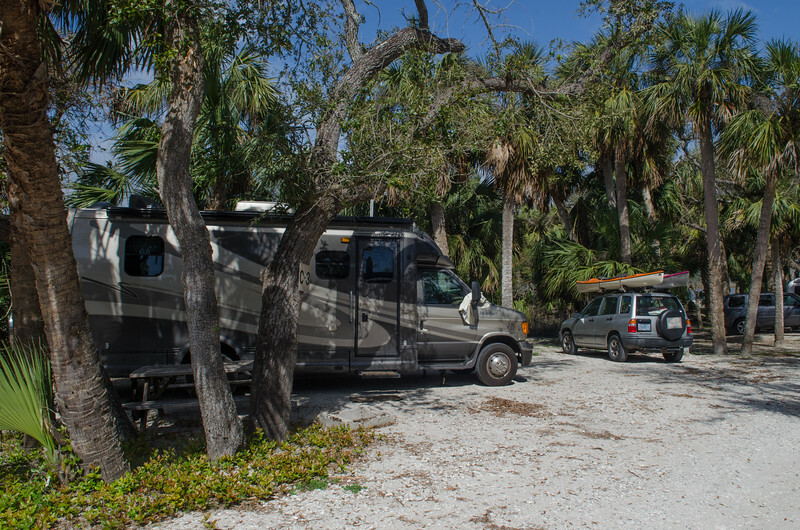 Comparing notes on coastal weather, campgrounds, RV destinations, rig configurations and all those interesting topics that make my townie, non RVing friends look a bit vague and simply yawn. A walk down to the southern end of Harris Beach on the South Beach Trail with the dogs was on the agenda, and with a couple of camera toting shutterbugs and two happy dogs we took off walking. The time at the beach was great, and the dogs were perfect entertainment. We laughed and talked some more and did the obligatory time-release camera shots on the beach, propping cameras on near-by rocks to take photos of the four of us together. It was great fun. Mo and I are solitary travelers, enjoying our own company and not big socializers, but now and then some companionable friends are a delight. I know our paths will cross again, and next time we might actually have to get out the dominoes! Back at camp, with some good Alaskan Amber and a few snackies, the conversations flowed on till early evening. The two of them had a couple of hours to drive back to their camp at Cape Blanco and hopefully they made it home before dark. Mo and I decided that all the excitement was just too much fun and we skipped the campfire for the evening and settled in to watch a delightful little movie called, “Love For Rent”. I think the R rating is for some of the four letter words in the beginning, the most of the movie isn’t R at all. We both really enjoyed it. Maybe we were a bit optimistic when we thought we could just amble off to the Oregon Coast without worrying about planning ahead. After all, September and October are the best months of the year on the coast, and all those folks who know about the summer fogs have been waiting for the warm sunny skies predicted for this week. When we left Rocky Point and traveled to Grants Pass before turning west on Highway 199 the skies were filled with smoke from fires nearby and far away. The temperature climbed as we dropped down into the valley, and as we passed the Valley of the Rogue State Park along I-5 the thermometer read a blistering 102 degrees. I thought of the Gypsy G-Mas, Connie and Tracy, as we managed to stay cool with the windows closed and the air conditioner going full blast. Last I heard, they were camping in this lovely park, although not quite so lovely on this incredibly hot September day. The western route through the Illinois Valley is a familiar one to us. The winding curves that follow the Smith River in California to Highway 101 don’t seem at all scary any more. As the miles passed, we watched the temperature gauge drop steadily. Turning north toward Brookings, I could smell the ocean and the hot sun was gentled by a misty fog drifting from the ocean to the surrounding hills. When we arrived at Harris Beach State Park, we were met by a sign stating that all electric sites were taken and the only available sites were for tents or rigs less than 20 feet. The attendant was a bit concerned, but she decided to let us try to slide into one of those sites. The MoHo fit just fine, with the Tracker parked sideways with ALL FOUR WHEELS ON THE PAVEMENT! Yes, those are the rules. The other rule is that no generators are allowed in the park, ever. It was after 7 by the time we settled in, but supper wasn’t a problem because we had grilled chicken and cucumbers in vinaigrette while we drove down the road. Setting up the rig without hookups is an easy thing as well, and after a nice long walk through the campground we settled in for a cool moonlit night of reading and early to sleep. The attendant was concerned that we were officially too long for the spot and told us to come in at 10 the next morning to see if there was anything available. Seems as though the park is almost completely filled every night this week. Waking to fog this morning wasn’t a surprise, and after tea we drove into town to get a few groceries, check out the potential storage place, and take a short drive up the Chetco River. There is another state park about 7 miles east away from the ocean and the sun was out. We both were in a beach mood however, and decided that if there wasn’t anything at Harris Beach we would go down to the Beachfront RV Park, right along the ocean, rigs lined up in a row on pavement, with a bit of dry grass, but full hookups. After ten, back at Harris Beach, the new attendant at the window was skeptical about anything available for the next 3 days, but then as an afterthought decided to give us a site that is usually saved for last minute overflow. We got a site with electric, water, and great cable TV all the way through the weekend. Once again, everything worked out just fine. The move across the park was a snap, and within minutes we were set up comfortably, and enjoying our space. I even opened up the awning and put up the chili pepper lights that I haven’t had a chance to use for a very long time! After lunch we took Abby for a long walk down the South Beach Trail to the ocean. The fog was still drifting about, lifting a bit now and then, but never completely going away. In spite of the fog it was quite warm, and we could have worn shorts and skipped the jackets. It was surprising how much warmer it was down on the beach than is it a couple of hundred feet above the cliffs in the park. We had a great time with Abby, and for the first time she decided that going for her ball in the ocean waves wasn’t as scary as she thought. We found some brackish backwater for her to practice, and then Mo started throwing the ball toward the surf and Abby went right after it. Before our walk was finished, Abby was going right into the waves after her ball, and only once did a wave catch her and throw her around a little bit. It was great fun. Tomorrow is wide open for relaxation, walks and one more special treat. Tracy and Connie are just north of us at Cape Blanco and plan to come down tomorrow afternoon for a meet and a visit. I’m tickled that we again have a chance to meet some fellow bloggers. Tracy and Connie have a great story, deciding to go full time and live a life outside the box. I have followed them for some time now and am looking forward to hearing some of their stories in person. As early evening settles over the park, the skies are clearing and the sun is shining brilliantly. Tonight the moon is nearly full. Mo has a great big campfire going with wood we bought here at the campground. Crossing from Oregon to California with firewood is frowned upon so we paid the pricey 5 bucks a bundle to follow the rules and use local wood. I am so happy to be at the beach again. A few more photos of our day at Harris Beach are linked here. Mo and I met in early 2003, when I was brand new to Klamath Falls and didn’t know a soul. We discovered early on that we both like to travel and camp. Mo had a sailboat at the time, and one of our first shared camping trips was to Medicine Lake, a short 100 miles south of Klamath Falls on the Medicine Lake Highlands east of Mt Shasta. As you can see, in those days we camped in a tent and slept on the ground. A couple of years later, in the spring of 2005, Mo bought the first baby MoHo and we again traveled to our favorite little lake to camp and sail. By 2007, we had a new MoHo and had decided that launching kayaks was a bit easier than launching a sailboat, but again we traveled to Medicine Lake to camp. The last time we camped there was during the fires in California in July of 2008. We keep telling ourselves we have to get back to Medicine Lake, but somehow other destinations keep coming up. In 2009 I was completing my final year of work. In 2010 we traveled 7800 miles or so to the northeast side of the country, in 2011 we went to Alaska. Finally! We are going to Medicine Lake this week. I have completed all my work assignments, the skies are clear, the snow has melted (Medicine Lake is at 7200 feet) and all is a go. Until…as I said…the best laid plans. Any of you who have followed this year read about the vandal attack last March on the MoHo when she was stored in Redding, California. We have been mulling over and over about our options for this coming winter. The one sure thing is that we want the MoHo OUT of Klamath Basin when the snow flies. Neither of us is particularly interested in chaining up a big rig and trying to exit any of the snowy passes that surround us. Mo started calling around, thinking maybe Medford, or possibly Grants Pass. Well inside, or even covered storage seems to be at a premium in this part of the country. There are no inside RV storage facilities in Medford, and the one facility in Grants Pass is full with no expectation of a vacancy. We could park the MoHo there, uncovered, for 35 bucks a month, but that would mean winterizing every time we wanted to go somewhere. So where do we usually go in the winter? Toward the coast, of course. And South! My least favorite route is through the central valleys of California. Where is the banana belt of Oregon? Brookings! TADA! Mo found an inside storage in Brookings, not cheap, and about a four hour drive from here. As we talked about it, however, even if we stored the MoHo in Grants Pass we would probably be driving to Brookings anyway. Now back to the best laid plans. Sigh. September is almost completely filled up already. I have a Colorado wedding, family coming to visit late in the month, a major exterior painting project on the books for mid-month, I will need to work next week, and our only free time seems to be right now. Of course we want to check out the facility in person before we commit to six months of expensive storage. Guess what!? We aren’t going to Medicine Lake AGAIN! Instead this afternoon we are packing up and ambling west to Brookings. We love Harris Beach. We have no reservations, and are planning on taking one of the first come/first serve sites. We are taking bikes for the great bike trail and knowing that the rivers will be too low for paddling, we are leaving the kayaks behind. This time I am packing long pants, sweats, shorts, jackets, sandals, ready for whatever the Oregon Coast delivers. Forecast is for sunny, warm days, but it won’t matter, the ocean is always there, the rocky beaches are calling. Medicine Lake will still be there next year, I am sure, unless of course Mt Shasta decides to do her thing, but that isn’t too likely. We have talked of moving to Brookings, and it will be nice to spend a few beautiful September days in one of our favorite places. I follow a lot of RV bloggers, and have learned so much from many of them. Of course I have favorites, but I certainly don’t plan to publish a list! Most bloggers have something wonderful to say and interesting to report at one time or another, and in spite of my personal favorites, many of them could be a favorite for a day at least. Donna K and Russ just happen to be pretty high on that list, and are favorites almost every day. With their location just north of us in Eugene, I knew that we would eventually get to meet each other. We had a leisurely morning at camp, and were especially glad that we had packed up all the outdoor chairs and rugs the night before since the morning was once again damp and misty. The RV dump at Silver Falls is at the far north end of the park, a few miles from the campground, so we hooked up the baby car and traveled that winding road one more time to dump, and then one last time to travel back south toward Salem and I-5. I called Donna to confirm our ETA and we continued south on the 5 toward Eugene. It was an uneventful journey, and I had both a printed map from google and the iPhone tracking where we were and where we were going. We had agreed to meet at a pizza parlor on 126. Business 126. The exit east toward Highway 126 is actually on the freeway. I kept looking at the map wondering why in the world it was navigating us so far south and told Mo, “What the heck, take the 126 east to Springfield.” Less than a minute after the turn I saw my mistake, and the phone rang at the same time. It was Russ. “Hey, we just saw the MoHo turning off on 126 and that is the wrong turn!” I lost a bunch of points as main navigator in that moment and we laughed together on the phone while Russ told us how to cross Springfield from our new location and get back to the pizza parlor. I think it is really amazing how well you can know someone you have never met from their blog and their comments on other blogs. Russ and Donna were exactly as I imagined them, fun, kind, friendly, honest, and lovely people. And funny! We laughed a lot together as we talked RVing, blogging, Oregon, and our families. Thank you for the pizza, guys, and the wonderful visit! I am looking forward to all of us getting together again when Russ and Donna head toward our part of the world. Russ was actually raised in Klamath Falls, and I found out that Donna and I grew up at about the same time within miles of each other in the Southern California world. In fact, I keep wondering if Donna maybe went to the same church camp I went to in Idyllwild, California. Another fun little resource for me happens to be Facebook and now Google Plus. Laurie (Semi-True Tales) and I are Facebook friends, and even though she hadn’t yet blogged about her travels along the McKenzie River, she had posted a photo on Facebook of the lovely falls. Mo already had suggested that she wanted us to take a different route home over 126 to Sisters. I got out the Gazetteer map for Oregon and perused the route looking for waterfalls, and sure enough there was a trailhead with two waterfalls right near the road. The drive was beautiful, with a stop at another small donated state park along the river for a walk before we passed through small towns and tiny communities. Not long after the road starting rising to the pass we came to the parking area for the falls, and with an amazing coincidence, the lone space for an RV was empty, even though there were many people parked in the lot. We took it, turned on the fan for the cat and were thrilled that we could hike with Abby on a leash. By the time we arrived, it was mid-afternoon, and we did want to get home before dark, so we opted for the shorter hike on the east side of the falls. Laurie’s photos of the falls are from the longer west side hike and she has some very interesting information about the formation of the falls and the McKenzie River on her blog. Check it out here. I kept looking at Laurie’s lone photo thinking this had to be the same waterfall. Sure enough, when I arrived home later Laurie had posted her wonderful account of their hike and it was the same place. Thanks, Laurie, I might not have known that the stop was worth finding if I hadn’t seen that photo. When I got out of the rig, I could immediately smell the huge falls. So much water! The forest was damp and dark, and the elevation was high enough that I didn’t see a speck of poison oak, bane of the western slope of the Cascades as well as the Sierras. The trail was excellent, with lots of steps, some roots and rocks along the way, but only a mile and a half to the lower of the two falls. I would love to return sometime and do the entire hike. It was lovely. We continued north over the pass and entered into the area decimated by the huge B&B Complex fire in 2003. There are now fire interpretive signs at several turnouts along the way that explain the biology of fire in the western forests. We pulled into one just over the pass to see smoke south of us in the Sisters Wilderness near Mt Washington. As we continued east, the smoke darkened the skies over Bend from the huge complex of fires ignited in Central Oregon from lightning the previous week. Mo’s brother Roger lives south of Bend in LaPine and we just couldn’t go by without stopping in for a visit. When I called Nancy, it was close to suppertime, but she said, oh yes, come on right now! We didn’t want to eat, so we all sat around and talked about RV’s and travel and good beer. Roger and Nancy just returned from a big RV trip to eastern Oregon and their stories of the nightmare of driving their big, older, wide-body Class A were scary. They actually lost brakes on a steep hill and ended up leaving the rig in Enterprise and sleeping with their kids and grandkids in their trailer. They spent quite a bit of time in the MoHo with us, asking questions and checking out our smaller rig, making lots of noises about how it was time to downsize. The next day we got a note from Roger saying they bought a new rig in Bend, about the same size as our MoHo. I am so happy for them, especially for Nancy who was the one having to ride in the scary passenger position with all that glass overlooking the cliffs and seeing that back wheel go over the white line on the right side of the road. I hate that! Things should be easier for them now. When we finally arrived home in Rocky Point after our long meandering day, it was 9 pm and dark out. Driving down highway 97 in the dark from Chemult is one of my least favorite rides, there are deer everywhere. We were spared any big scares, however I was sure glad when we finally turned into Easy Street. Seems as though there is always some kind of festival going on during the summer months. Usually named for a flower, a fruit, or a vegetable, these festivals are really worth the effort. The Garlic Festival in Gilroy, California and the Asparagus Festival in Stockton are some down-home country festivals that got completely out of control. Thousands of people crowd the hundreds of booths and the original concept is lost. Can you count the Apple Festivals and Strawberry Festivals that are dotted all over the United States and Canada? A google search will open your eyes to that one! Our short little camping trip north was inspired by one such festival. The difference with this one is that it isn’t a town or village thing, it is a chance for a local grower of dahlias to open their land for just six days a year to the adoring public. I had no clue just how adoring the public was until we arrived at the parking lot on Monday morning and found row after row of cars, buses, vans, and fields filled with folks admiring the dahlias. Let me backtrack a bit. When we woke up Monday morning, the skies were cloudy and overcast and the temperature was in the low 50’s. A very light mist created a chilly, damp atmosphere. Remember I said I only brought shorts? Even though the forecast was for 85 degrees and sunshine for the entire week, I should have known better. Digging around in the few clothes I brought delivered my kayak pants, just in case, so I donned the kayak pants and the one sweatshirt I managed to pack, and I was ready for the day in spite of myself. Even though I had no WiFi in the park, my iPhone had 5 bars and 3G, so I loaded up google maps to locate the Swan Island Dahlia Farm. It was just about an hour north in Canby, an agricultural paradise between I-5 and the mountains in the northern part of the Willamette Valley. We took our time, and when a sliver of lavender blue appeared in the distance, we ambled off the course to find amazing fields of annuals grown for seed by the Silver Falls Seed Company. I used to grow annual larkspur for drying, and always had trouble finding seed that was an individual color not a mix. Lying in front of me were gorgeous fields of blue, lavender, pink, and rose, all perfect tall lush flowers of larkspur. Other fields were filled with godetia, one of my favorite little annuals, and other flowers that I didn’t quite recognize. In a way I was delighted to have subdued skies so the colors would show up more dramatically in the photos. It wasn’t long before we arrived at the Swan Island Dahlia Festival, to join in the admiring crowds with their oohs and aahhs. Even little kids were getting into the thrill of seeing a truly amazing huge dahlia bigger than a dinner plate, amazed at the sensory overload of row after row of flowers bred in every conceivable shape and color. Swan Island Dahlias is the largest and leading dahlia grower in the United States. The farm is now located in the town of Canby, in the rich soil of the Willamette Valley of Oregon. The farm was originally located in Portland, Oregon, with some buildings on Swan Island, which is where the farm derived its name. There was also a roadside stand in Sellwood, a suburb of Portland, so the business was known as both Swan Island Dahlias and Portland Dahlia Gardens at that time. Swan Island Dahlias was moved to Canby, Oregon on rented land in the 1940’s. Around 1953, 20 acres of farmland was purchased in Canby, and the business was relocated to its present site. This particular bit of information was helpful because Mo grew up near the real Swan Island and picked beans there and she couldn’t understand why the dahlia farm in Canby was called Swan Island Dahlias! If you have ever grown dahlias, you know how much work they can be. A difference in this part of Oregon is that the climate allows you to actually leave your dahlias in the ground over the winter and still have flowers come up in the spring. Where I lived, I had to lift my hundreds of dahlias one by one every winter, divide them and pack them carefully in sawdust in the root cellar. I treasured those flowers, believe me. So I was like all those little kids ooh-ing and aah-ing through the fields, thrilled and amazed, and especially excited when I would find an old friend variety among the bunch that was still in cultivation. After we wandered the 40 acres of fields, we visited the big storage shed where one of the granddaughters in this family owned business demonstrated how to arrange dahlias while she talked about every possible cultural need. Many folks asked lots of questions and I was amazed at her knowledge. Grandpa passed away in 2007, but the family carries on with this beautiful family business. Thoroughly overloaded with dahlia heaven, we were still in for a big surprise when we entered the indoor display, with three rooms of dahlia arrangements. I knew about the indoor rooms, but imagined something a bit like a county fair, with vases of flowers. What an understatement. The huge displays in the three large rooms were mind boggling, huge lush over-the-top craziness, piles of dahlias of every color and type. Hundreds of flowers in a single arrangement and literally hundreds of arrangements. It was a great way to pick your favorites and then go to the order desk to buy tubers for spring delivery. It’s a good thing I don’t have a lot of room or a long growing season, or I would have parted with a good chunk of money. When we finally left the farm, the sun was warming up a bit and we ambled around Canby to explore the town and the area. We found Molalla River State Park, a perfect place for Abby to run in the off-leash dog area, with many trails along the river, but no overnight facilities. Just north of the farm, we found the Canby Ferry crossing the Willamette River and saving many miles of travel for folks going north. The ferry is free for pedestrians, but we just chose to sit on the bluff above the river and watch for awhile. I couldn’t help comparing the gentle crossing with the wild currents of the Yukon River at the ferry in Dawson City. This crossing took all of two minutes, and the cars lining up on either side of the river had at most a 5 minute wait in line. I love how these remnants of older times appear on the back roads of Oregon. Many of the old ferries have been replaced by bridges, so it was nice to see this little piece of history still in operation. We traveled home through Silverton, with a stop at on of my favorite grocery stores for a few supplies. Back in camp, we decided we had time for some good biking on the beautiful trails and enjoyed the emptiness of the day use area even though the campground was still full to the brim. No one was swimming, and no one was out on the bike trails either, and the waterfall trail was nearly empty. Abby is pretty good at going along on the leash while we bike, but now and then she gets a bit excited and crosses over to the wrong side. We have learned that if I stay in front of Mo, Abby will try to keep up with me and not dawdle. The best part of this for Mo is that Abby actually helps pull her up the steep parts of the trail! I finally said, “My turn to have Abby, this hill is steep”! We switched, and I couldn’t believe just what a difference she made. Mush! Abby!! Home to camp and grilled veggies and another beautiful campfire. It has been less than two weeks since we returned from our long trek to Alaska, but a short three day jaunt to a beautiful Oregon State Park seemed just so simple. We planned this trip for a couple of reasons: For one, we loved Silver Falls when we visited in the spring of 2010. The real reason for the trip, however, was to see the dahlias in full bloom during the Swan Island Dahlia Festival nearby in Canby. I grew hundreds of dahlias at one time, selling cut flowers at a weekend farmers market along with my dried flower bouquets and fresh herbs. It was a good time in my life, but oh sooo much work. Here at Rocky Point, I don’t have much opportunity to grow dahlias, although I still plan to at least try. Mo and I plan to downsize by 2020 or so, and my one request is that we do so in a place where I can putter in a real garden with a real growing season and grow dahlias. As we readied for the short trip, 255 miles total, everything seemed just incredibly simple. The MoHo was spotless and lovely, and I only needed clothes for three days and two nights. With the temperatures predicted for the area in the mid 80’s, shorts were in order, and I didn’t even bother with sweats or long pants. (Oops, we live in Oregon for pete’s sake!). Food was simple as well, just two dinners, a couple of breakfasts, and some hiking food for daytime. Gee. We were loaded and ready to go in no time. After the long preparations for the Alaska trip, this was such a delight. We took our time getting on the road, enjoying the warm, sunny morning. Dressed in shorts and sleeveless tops, we were glad to have returned home to Oregon in August to enjoy what Laurie and Odel called the “elusive Oregon summer”. Yes, it IS elusive at times, but less so on the east side of the mountains where we live. Fire is a given in the west, and as we crossed the Wood River Valley just north of home and the Upper Klamath NWR, there was smoke evident to the east and north from the many fires ignited in Central Oregon over the past couple of weeks. The route is familiar and a bit boring at times, especially north on Highway 97. The soils are deep pumice from the eruption of Crater Lake (Mt Mazama) more than 7,000 years ago, and the vegetation is dry lodgepole and ponderosa pine. Only after the route rises to Willamette Pass does the timber begin to thicken and darken to lush Oregon green. The Willamette Valley is the heart of Oregon, even though the actual area is very small when compared to the entire state. Eugene is the largest city south of Portland in this valley, and as we entered Eugene we noticed the brown pall of smoke in the air from burning fields of blue grass, from dust rising from busy plows, and yes, from cars. I think that is actually smog, although being raised in Southern California I do know that real smog is a bit uglier than what we found on the Eugene skyline. By the time we got to the park, it was evident that even on a Sunday afternoon, this was a very popular place. I am glad that we made a reservation back in April, since the park was completely filled for the entire week! It was warm and sunny, and we were glad for a shady site with power and water to enjoy the late afternoon. Jeremy was really anxious to get out of the rig and explore, and I put on his fancy city harness and he was out of the rig before I could get down the steps. He is funny, sitting quietly for the harness, and the minute the last snap is done he jumps down to the door knowing it it time! Even at 15 years old, I think he might want to explore farther than I would want, so I keep him harnessed when we are camping for safety. As the evening progressed, we took the beautiful paved bike trail to the dog exercise area, a special treat in a state park because this one if for dogs off leash! To our surprise, on this warm Sunday evening, there were no dogs there. Families were everywhere, with children playing in the swimming area along the Silver River, bbq’s going at every picnic table, volleyball and soccer games in progress. The park is within easy driving distance of Salem, Albany, and even Portland, and from what we saw on this Sunday afternoon, it is a popular place to spend a Sunday. The presence of huge, extended families with grandmas, grandpas, babies, aunts and uncles, all enjoying the afternoon together was heartening. Most of these families were speaking languages we didn’t know, but with the din of so many conversations that really didn’t matter. The language of a park on a Sunday afternoon is universal, after all. We had a great time letting Abby run uphill, hoping to wear her out. Later in the day, we expected to have to leave her in the rig while we hiked the waterfall trails where dogs are not allowed. One more time I did a stupid crash, this time thank goodness without the camera in my hands! Stepping out of the MoHo I missed the step and bent the weak ankle one more time in a direction it doesn’t particularly like and went down. I know to hold on to the door handle, and had a good grip, so didn’t go all the way down. Mo laughed again, saying I must have bones of steel because with all these stupid falls I don’t seem to break anything. Who knows what that is about. This time again, it was a big divot I didn’t see because it was UNDER our entry rug. Sigh. Hold on tight and keep your eyes down, I guess. We chose a camp on the A loop again, but it was more open than I might have liked. Our neighbors were right behind us, with their campfire so close to our back window that I had to close the night shade all the time so they couldn’t see inside. Our fire was far enough forward in the site that we could sit there without being in their back pocket, and we were glad that the folks directly on our other side seemed to be indoor types, so we had a bit of space to ourselves. I couldn’t believe how many kids were in that campground, and dogs, and bikes. It was some kind of biking heaven, I guess, with tiny little kids on trainers with helmets bigger than they were. The sound of screaming, laughing kids and barking dogs was almost deafening. So often, in this lifestyle, we hang with retired folks in sedate RV campgrounds that are quiet and calm. We are retired ourselves, and live in a community that is composed mostly of retired folks or summer visitors. My grandkids are all teenagers now, and as I sat at our campfire watching all those kids, I realized just how insulated we can be from the din of family life. Have I used the word “din” a lot? Hmmm. Sunday afternoon at Silver Falls State Park was a lovely and noisy place.